Researchers have come to the conclusion that the enigmatic set of handprints were not made by human beings. Located in the vast arid desert near Egypt’s southwestern border with Lybia, amateur explorer stumbled upon the ‘Cave of Beasts’ in 2002. The cave, also known as Wadi Sura II, includes a total of 5000 images painted or engraved into the stone over 8,000 years ago. The mysterious set of handprints, which amateur explorers discovered in an Egyptian cave in 2002 were not created by humans after all. A new study shows that the hands are too small and fingers too long in order to have belonged to a human species. 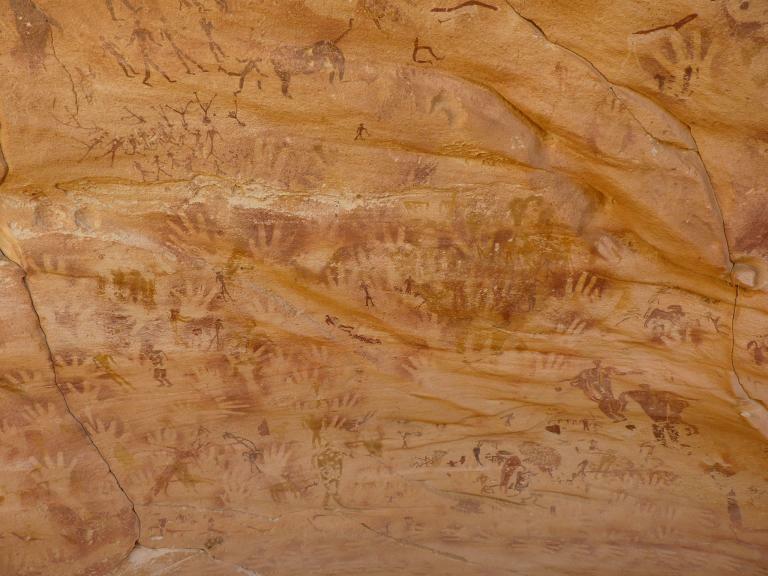 A new theory suggests ancient hunters could have created the handprints by holding up lizards. However why ancient hunters would have done this remains a mystery. The new theory is somewhat conflicting and many do not agree, suggesting the truth behind them is far more mysterious than we are willing to accept. Researchers first believed that the anomalous ‘prints’ engraved in the stone belonged to the hands and feet of baby children, but a new researcher has shown otherwise, suggesting that the traces left in the cave did not belong to humans but… lizards. Anthropologist Emmanuelle Honoré of the McDonald Institute for Archaeological Research stated she was stunned when she saw the shape of the small prints, which at first impression, might resemble small baby hands. To understand who or what left those prints behind, Honoré compared measurements taken from the hand outlines found in the Cave of the Beasts with those taken from the hand of newborn children, including the measurements from newborn premature babies. The results were clear, the depictions left behind in the Cave did not belong to humans and Honoré concluded that there is an ‘extremely low probability’ that the hands in the Cave of the Beasts were human. The Anthropologist believes the mysterious marks might have been created by hunters who used the forelegs of desert monitor lizards or even crocodiles to make these marks. But no one can come up with an explanation as to why people 8,000 years ago would use lizards or even crocodiles to leave such marks behind. This explanation makes no sense according to many other researchers who look for alternative explanations. The National Geographic writes: Honoré is reluctant to speculate on why such a civilization would imprint the legs of animals on their cave walls. ‘It’s very challenging for us as researchers to interpret these paintings since we have a culture that’s totally different [from the one that created it],’ she said.